In Ravenna in Late Antiquity, Deborah Mauskopf Deliyannis looks at one of the most important cities of late antique Europe over the course of 350 years – tracing its expansion as well as its artistic growth. Many remarkable works of art and architecture from this late ancient world still survive today. In fact, Ravenna’s heyday— roughly the fifth century to the eighth—is anything but dead. It is alive in an array of churches, basilicas, baptisteries and tombs, many with evocative images on their surfaces and interiors. Other periods make themselves present in Ravenna, too. There are Roman ruins that reach back to the days of the republic and city gates from the late Middle Ages and Renaissance—and a 15th-century castle from the era of Venetian rule. Ravenna was once the home of emperors, kings and viceroys, many of whom tried to leave behind a material legacy as grand as their aspirations to political glory. Poised between West and East, the city served as a major outpost for two empires: those of Rome and Byzantium. 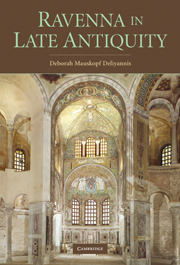 “Ravenna in Late Antiquity,” by Deborah Mauskopf Deliyannis, is both a narrative history of the city’s ruling elites and a survey of its architectural and artistic treasures. These treasures are worth pausing over. Staring down from the walls of the Basilica of San Vitale, for instance, are portraits in stone and glass tesserae of several figures. The Byzantine ruler Justinian (483-535) is shown wearing a halo and, well below, startling red and purple shoes; his archbishop Maximimian is wrapped in a white tunic and gold vestment, with the pallium draped over his shoulders, his “blazing blue eyes” staring from a “lean, intense face,” as Ms. Deliyannis puts it; the Empress Theodora, for her part, stands among eunuchs and female attendants holding a gem-encrusted chalice. No visitor to the basilica in the early sixth century, peering up at such august notables, would have any doubts about who was in charge, in the earthly realm at least. In fact, Justinian and Theodora never lived in Ravenna—and apparently never visited. But many other rulers made the city their home. For example: the Western Roman Emperor Honorius, who moved the seat of government there in 402; the Visigoth kings, who swooped down from the north in the fifth century and controlled, for a time, most of the Italian peninsula; and the so-called exarchs—the viceroys who governed Italy from Ravenna on behalf of the Byzantine emperor well into the eighth century, before the Franks and Lombards arrived from Gaul and the Danube Valley and the city became more a repository of architectural fragments than a thriving capital.